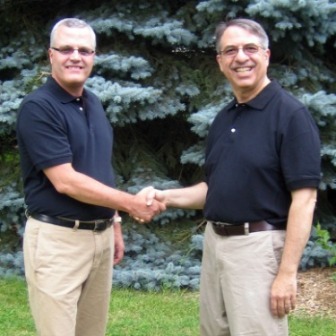 Meet Gary DeGregorio and Keith Ten Brook, co-founders of the online business called Decision Innovation, Inc., and Featured Business Owner of SCORE Chicago this week. Learn how they started and what tips they have for your success. Decision Innovation, Inc. provides software, tools, and expertise that enable decision makers to navigate and accelerate complex business decisions. Our unique group decision making software promotes organizational alignment and ensures a “single version of the truth” across your organization. The problems with decision making today continue to get worse as complexity increases. People and the information they use are disconnected. Businesses often lack a common reliable approach to decision making across their organizations. Teams within the organization are out of alignment with one another as well as with the business strategy. Trends in technology and complexity are causing individuals to be overwhelmed with both information and cognitive overload. We believe our recently released Decision Knowledge Center (DKC) cloud-based software addresses these decision making problems, and empowers organizations to collaborate, communicate, and innovate in new ways to save money and grow. In the broadest sense, our potential clients are any business, organization, or individual that wants to become more successful through more effective decision making. Our current focus is on clients dealing with Innovation Management, Business Strategy, Portfolio Management, and Talent Management decisions. In a recent specific case, we developed an Innovation Management decision template that can assist businesses in managing ideas through to commercialization. Now that we have launched our first product, the biggest challenge is getting the word out to the customers that could most benefit from our solution. We are currently focused on helping our customers understand the tremendous hidden costs associated with decision defects spread across their business. Frequently these develop due to ad hoc decision making processes, unaligned teams, and very real limits on our ability to deal with complexity. Our SCORE mentor is Peg Corwin, and she has helped us with online marketing, especially with the use of LinkedIn, Adwords, and where to focus online. Peg has actively been working with us to improve our product landing page and create targeted landing pages for key market verticals. We have also met with Mark Lieberman to discuss sales strategies. Avoid the common pitfall of looking at your key business decisions in isolation. Take a big picture view and understand the context for each decision. Be ready to modify decisions when new information shows that you are not meeting your business goals.